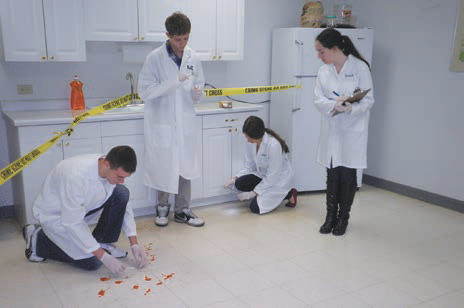 The Forensic Science program is comprised of two courses: Forensic Science I and Forensic Science II. Forensic science is the application of basic biological, chemical, and physical science principles along with various technological practices for the purpose of justice in the study of criminal and civil issues. Some of the major themes of study in this course include: careers in forensic science, chemical and physical properties of evidence, evidence collection, processing and analysis of trace evidence, document preservation and analysis, fingerprint analysis, DNA analysis, blood spatter evidence, toxicology, serology, drug identification and testing, ballistics, tool marks, anthropology, determining the cause and time of death, and ethics. This course utilizes and integrates many disciplines including the following: anatomy, mathematics, language arts, social studies (law and history), chemistry, biology, earth science, physical science, technology, and information systems. The focus on forensics in the media has made forensic investigations well known and is interesting to students. 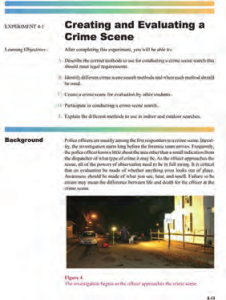 A clear, easy to follow format for student’s interpretations and answers is available. The flexible design allows for expansion with additional journal notes when needed. The layout of the journal encourages greater comprehension on the student’s part and allows for a permanent record for future reference. A comprehensive Instructor’s Guide is included to provide coordination and efficient equipment utilization. It contains scheduling guides, helpful hints and tips, and demonstrations. The Instructor’s Guide includes sample data, expected results, and answers for easy comparison to each student’s results.